A company can spend millions on marketing but many times the best marketing is done by good salespeople. An ad can get people in the door, but it’s the salesperson that can fill a bag with products. Generally I believed a good closer combines confidence, attractiveness and a certain je ne sais quoi. A trip to the Shoppers Drug Mart cosmetic counter always puts doubt into that stereotype of a success. Shoppers Drug Mart is Canada’s successful pharmaceutical chain. In recent years their stores have grown into pseudo supermarkets but its success has been built on lipstick and pills. Its offers clean, well lit stores with long hours and promises convenience at the highest possible price. Some experience in extortion must be a necessity for whoever does their pricing as their slogan should be “Where else are you going to find razors and tampons at 2 am sucker”. 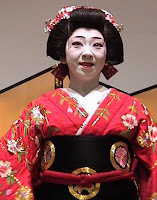 A visit to the cosmetics counter at an SDM resembles a trip to the theatre for the ancient Japanese art of Kabuki. Many people think their sales force resembles clowns, but clowns have a purpose for looking like complete idiots. They are clowns! The employees behind the cosmetics counter seem to think that they should have every product they sell on their face. The problem is that the women of Canada go to these people for advice, which is akin to going to Britney Spears for parental advice. The victims of this aren’t women, but the men who are forced to lie to the women in their lives. It’s not all bad for SDM. They always open, the lines are always short and the Life Brand is usually good for saving a buck or two. That is if you like short expiry dates and the worst bottled water in the country. As an avid customer of shopper’s drug mart, I become enthralled with they sheer elegance and excitement of each aisle I come across. Shopper’s to me is a home away from home. Seeing little Filipinos’ working the shelves at my local 24 hour Shopper’s makes me feel like Shopper’s is contributing to society in a very positive aspect. It feels like Christmas every time I enter a Shopper’s, the feel of what goodies will be to my choosing on each occasion gives me a feeling more fulfilling than my last lap dance. Life brand at times guilt’s me into buying them because of the price, makes you really understand that you’re just paying for Advil’s marketing campaign. Canadian Icon Shopper’s Drug Mart!!! !